The city of Novgorod, officially referred to since 1999 as “Novgorod the Great” (Veliky Novgorod), is a magnificent repository of medieval Russian art, with more than 50 churches and monasteries extending from the 11th through the 17th centuries. In 1992, this wealth of historic monuments -- centered on the Novgorod kremlin -- was honored with inclusion in the UNESCO World Heritage list. Medieval chronicles first mention Novgorod between 860 and 862, when the eastern Slavs summoned the Varangian leader Rurik to assume control of their affairs. Although the Rurikovich rulers transferred power to Kiev at the end of the 9th century, Novgorod continued to exercise control over a vast area of northern Rus. In 989, following the official acceptance of Christianity in the domains of Grand Prince Vladimir of Kiev, Novgorod was visited by Vladimir's ecclesiastical emissary, Bishop Joachim of Kherson. The bishop overturned pagan idols into the Volkhov River and commissioned the first stone church, dedicated to Sts. Joachim and Anna, as well as a wooden Church of St. Sophia, with 13 "tops," or domes. The political history of Novgorod was far from calm. The city not only frequently challenged its leaders, including Rurik, but also participated in the princely feuds that wracked the Kievan state. Nevertheless, Novgorod prospered during the 11th and 12th centuries as part of the Dnieper trade route from the Baltic to the Black Sea. With its mercantile wealth, the city had the means to create a citadel and an imposing architectural ensemble of churches. 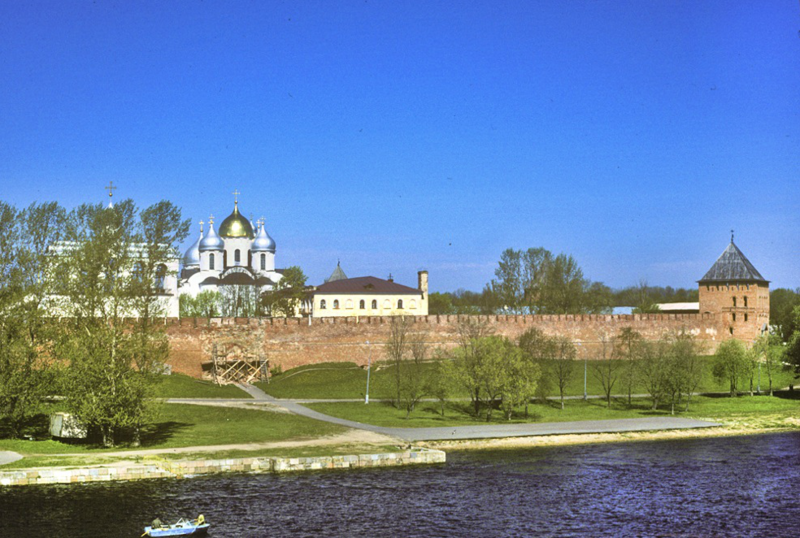 The Volkhov River, which separated the city into the Trading Side and the Sophia Side (after the Cathedral of St. Sophia), provided an essential link for trade and exploration within a network of waterways that led in every direction. The extent of this commercial activity produced literate citizens independent of Kiev and its representative in Novgorod, who was usually the brother or son of the Kievan grand prince. 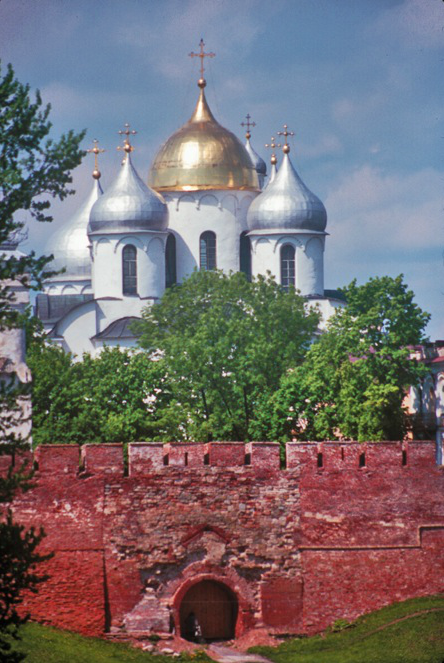 The oldest surviving and most imposing monument in the city is the Cathedral of St. Sophia (Divine Wisdom), built between 1045 and 1050 and located in the kremlin, on the west bank of the Volkhov River. The cathedral was commissioned by the prince of Novgorod, Vladimir Yaroslavich, as well as by his father, Grand Prince Yaroslav the Wise, and by Archbishop Luke of Novgorod. It is fitting that Yaroslav, whose own Sophia Cathedral in Kiev was entering its final construction phase at this time, should have played a role in the creation of the Novgorod St. Sophia. 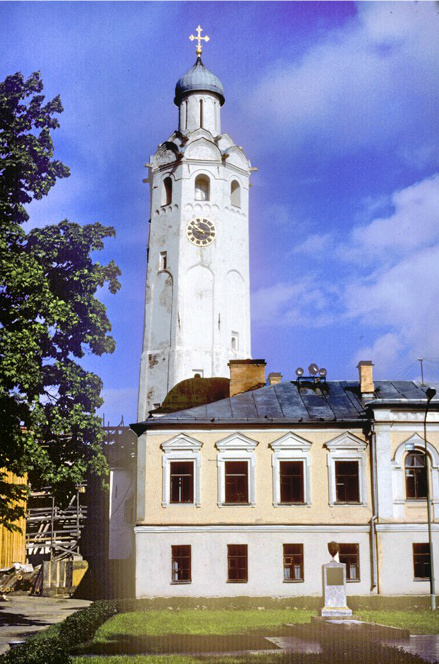 Novgorod that had been the base of his power during the reign of his father, Grand Prince Vladimir of Kiev. With the building of large masonry cathedrals dedicated to the Divine Wisdom in both Kiev and Novgorod, Yaroslav rendered homage to one of the most sacred mysteries of the Orthodox Church, and established a symbolic link between the two major cities of his realm and Constantinople. In addition Yaroslav's participation would have been essential from a practical point of view. 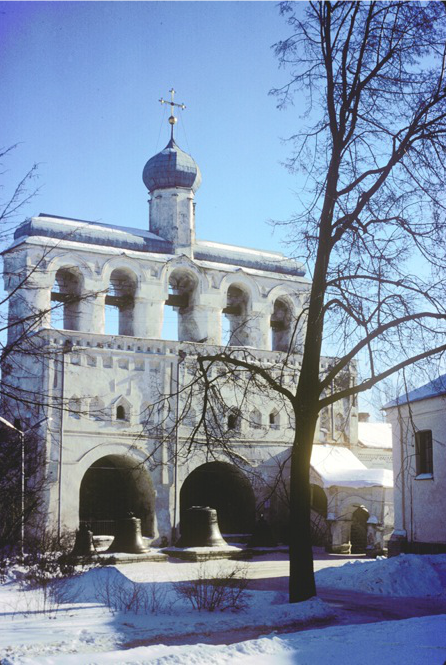 Masonry construction was rare in Novgorod before the middle of the 11th century, and a cathedral of such size and complexity could only have been constructed under the supervision of experienced builders. The builders applied a method of placing blocks of local rough gray limestone within a mortar of crushed brick and lime that imparted a pink hue to the coarsely textured façades. Narrow plinthos brick was used for the interior arches and vaulting, as well as for other segments that required structural precision. Stucco was first applied only in the interior, which was then covered with frescoes painted by local and foreign masters from Greece and the Balkans. On the exterior the cathedral walls presented a highly textured appearance, even after cladding with mortar to reduce the unevenness of the surface. The earliest reference to the application of whitewash to the walls appears in the Novgorod chronicle under the year 1151. 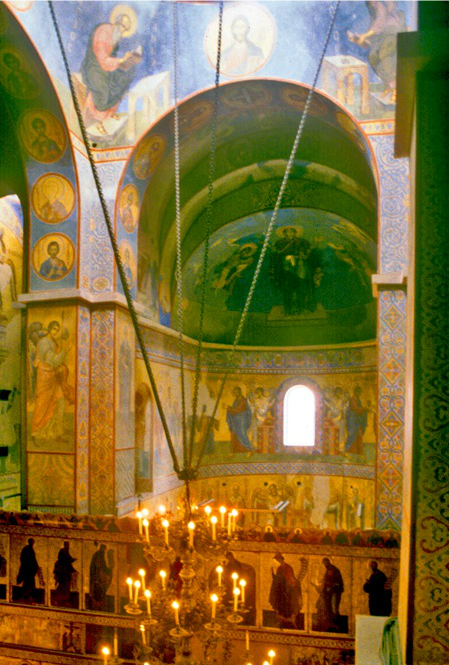 The Novgorod cathedral included enclosed galleries attached to the north, west, and south facades. Originally intended to be only one story, the galleries evolved during the building of the cathedral into an integral part of the structure on both levels. The north and south galleries contain chapels on the ground level, and the west gallery includes a round stair tower that leads to the upper gallery levels, including the choir gallery in the main structure. The facade above the west portal displays fragments of a medieval fresco depicting the Old Testament Trinity. The portal itself contains the bronze Magdeburg Doors, produced in Magdeburg in the 1050s and taken as loot from the Varangian fortress of Sigtuna by Novgorod raiders in 1117. 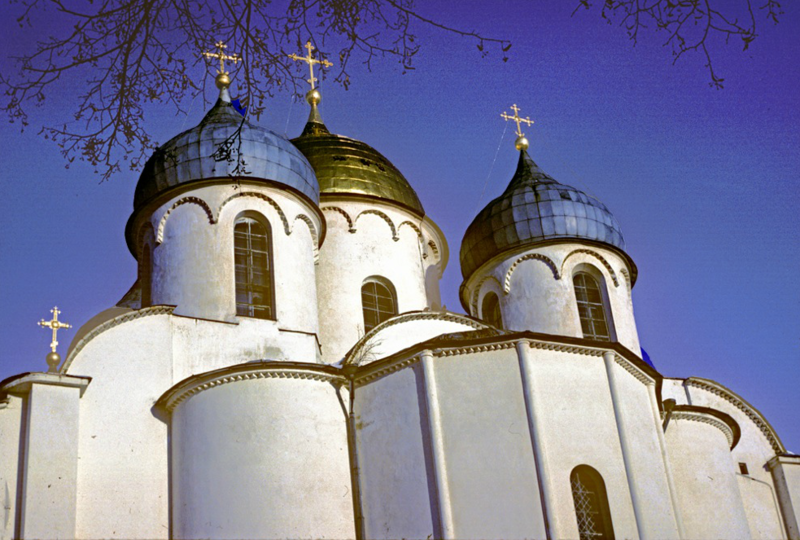 The culminating point of the Novgorod St. Sophia Cathedral is its ensemble of cupolas, whose original form would have had a lower pitch than the helmet-shaped domes now in place. The design is one of the most impressive moments in medieval Russian architecture. The dome over the central crossing predominates in height and diameter, yet the four subsidiary domes are so closely placed as to appear part of one perfectly devised whole. The structure itself provides an admirable base for the domes, with its lack of surface decoration and only the simplest of architectural details. The emphasis on height is maintained in the interior, where the piers of the main aisles soar directly to the barrel ceiling vaults. Novgorod chronicles indicate that the interior was painted with frescoes over a period of several decades. 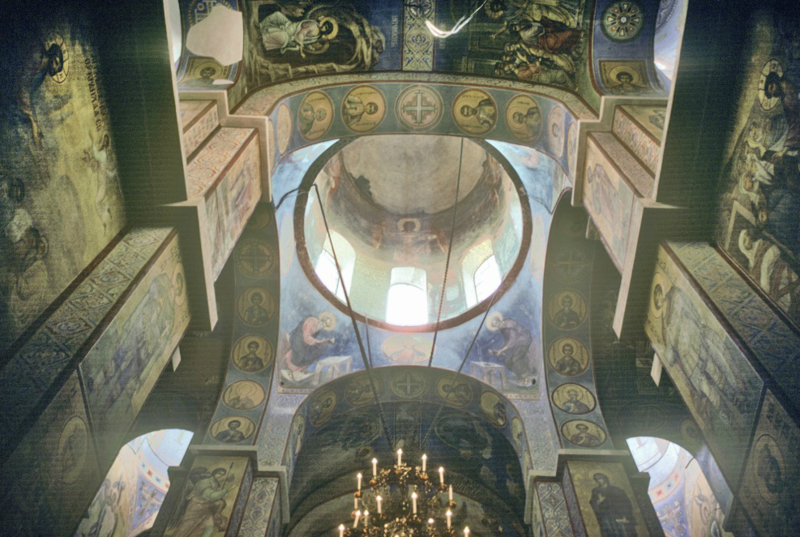 According to the Third Novgorod chronicle, soon after the completion of construction, "icon painters from Tsargrad (Constantinople)" painted Christ with his hand raised in blessing (probably an image of the Pantocrator in the central dome) and other representations of the Savior. Fragments of the 11th-century work, including full-length paintings of Emperor Constantine and Elena, have been uncovered, as well as early 12th-century frescoes. Most of the original painting of the interior has vanished under centuries of renovations. (The current frescoes date primarily from the 19th century.) The Novgorod cathedral lacked the elaborate mosaics characteristic of major churches in Kiev before the mid-12th century, yet there was decorative mosaic work on the floor and in the altar space. The St. Sophia Cathedral is surrounded by an array of historic monuments that include the massive Cathedral Bell Gable (15th-18th centuries), the Clock Tower (now dated to the 1670s) and the Archbishop's Chambers -- also known as the Faceted Chambers, originally built in the 1430s and substantially rebuilt in the 19th century. The fortress walls and towers have been maintained and restored to a 15th-century appearance, although some of the towers date to the late 13th century. Facing the St. Sophia Cathedral to the south is the gargantuan bell monument known as the “Millennium of Russia.” Designed by the sculptor Mikhail Mikeshin and others, the monument was unveiled in 1862 to honor the millennium of the founding of dynastic authority among the ancient Rus. At the top of the monument is a massive bronze globe surmounted by an angel holding a cross. Around the sphere are six statuary groups signifying defining moments in the history of Russian statehood, from Riurik, founder of the first dynasty, to Peter the Great, founder of the Russian Empire. At the bottom of the bell are scenes with exemplary figures from spiritual, cultural, state and military service. A notable omission is Tsar Ivan the Terrible, who sacked Novgorod and killed many of its inhabitants in 1570.